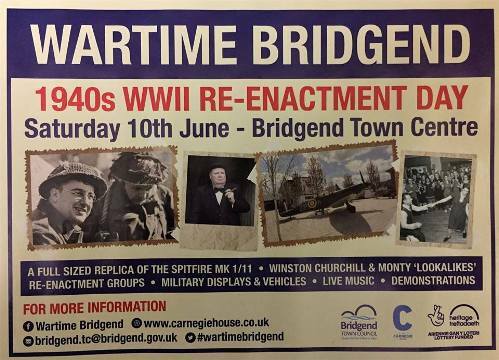 The town of Bridgend is going to turn back the clock to WW1 & WW2. in full support of this annual event. A family day, so see you there. 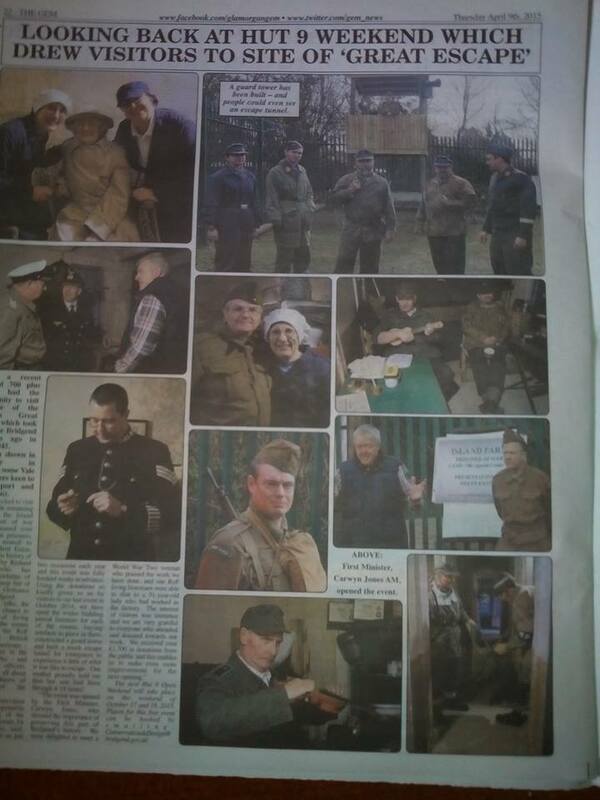 Hut 9 opens its doors to the public yet once more! 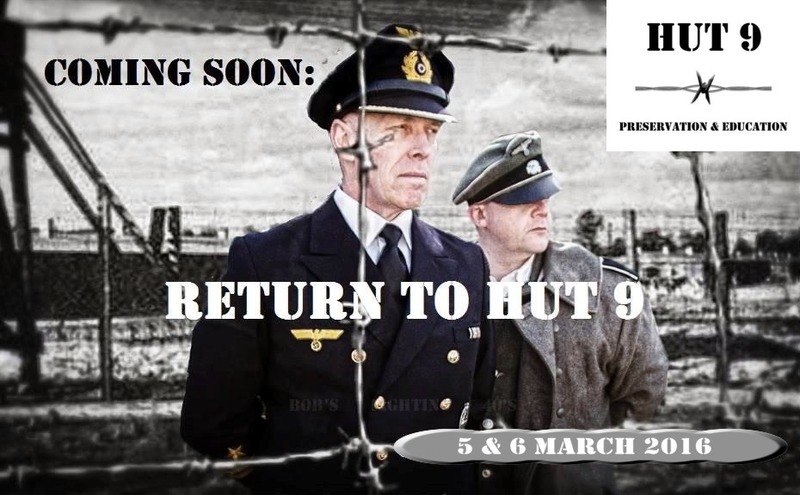 Following our special and once more extremely successful Open Weekend Event on 7-8 March 2015, we continue the celebration of this VERY SPECIAL 70th Anniversary YEAR of the Welsh Great Escape from Hut 9. So we are once again open our doors to the public in October 2015. Hut 9 opens its doors to the public once more! 2015 is a SPECIAL YEAR for Hut 9. On the 10th of March 2015 it was 70 years from the night of The Welsh Great Escape that started just before midnight on Saturday, 10 March 1945. When you book, please specify the day (Saturday or Sunday) and your preferred time slot. The Hut 9 tours run on the hour and start at 10am on Saturday with the last one commencing at 3pm and 9am on the Sunday with the last one commencing at 2pm. Each tour is approximately 90minutes long. Remember this is a FREE event and a great opportunity for all to learn. Show and teach your children what a significant part Bridgend played in WW2. We hope to see those of you who booked, there! Thank you for joining us during this Event and hope you all enjoyed the Hut 9 Living Experience. - All visitors (and a big Thank You for the generous donations; they will help us for next year's Events - see above). On Saturday 31 May from 10am - 5pm the Hut 9 Preservation Group will be holding an Outreach Event on two floors at Carnegie House (old Library) in Bridgend town centre. There will be displays, talks, and living historians will be present. It's an opportunity for us to tell the story of the occupation of the camp and to raise awareness of our plans. It's a free event but donations will be gratefully accepted. Please come along and show your support! 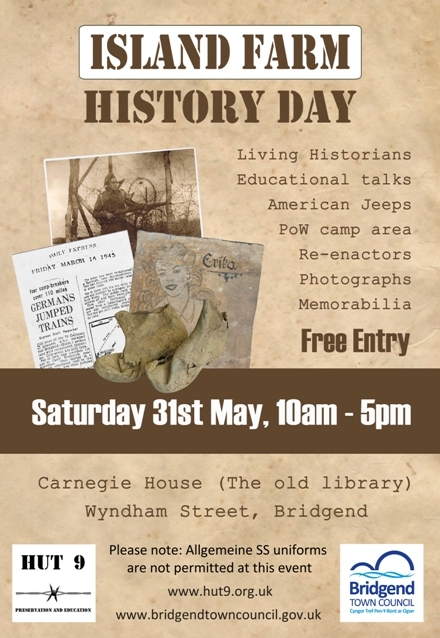 Special thanks in advance to all the living historians who have agreed to come along and contribute to our Outreach Day at Carnegie House in the centre of Bridgend. * STOP PRESS * We have got permission to bring an American Jeep in town and park it outside Carnegie House. Everyone's support is very much appreciated by the Hut 9 Preservation Group! First World War centenary marked at free Bryngarw event. Visitors to Bryngarw House and Country Park will be able to step back 100 years for a fascinating glimpse into life during the First World War at a free ‘This is YOUR Heritage’ event on Sunday 11 May between 10:30am and 2pm. The lawn in front of Bryngarw House will be transformed into a trench with battle re-enactments, the local community arts bus will be showing First World War films and audio in a ‘pop-up cinema’, while families will also be invited to take a walk through the park’s woodland for a soldier survival skills demonstration. In a further tribute to the war’s centenary, children will enjoy having the chance to make puppets in a workshop inspired by the ‘War Horse’ stage show. All Hut 9 inside tours for this weekend are already fully booked. We are sorry, but as explained above, visitor numbers are limited. However, should spare spaces become available or people fail to turn up, then we will of course re-allocate these on a first come first served basis. Hut 9 opens its doors to the public! Hut 9 is all that remains of Island Farm. During the weekend event, visitors will be given a chance to tour inside Hut 9 and learn all about it. The Hut 9 rooms have been restored in an attempt to try and recreate how they would have looked during 1940-1948. Members of the Hut 9 Preservation Group and WW2 re-enactors will be telling the fascinating stories of the 4 time-frames of Island Farm, occupied by the Royal Ordnance Factory workers, the American Forces prior to D-Day, the German POWs (known then as Camp 198) and later the High Ranking German Officers awaiting their Nuremberg Trial (camp was known then as Special Camp XI). Outside Hut 9, there will be WW2 re-enactors with all their "kit" and and their vehicles (weather permitting). Brett Exton will give a very interesting full talk on the complete history of Island Farm. Richard Williams will complement Brett's talk and guide you inside Hut 9. Prior to the demolition of the other huts at Island Farm, the actual drawings made by the German POWs were carefully removed and preserved. A number of the famous Island Farm wall drawings/ paintings will be on display inside several rooms/ dormitories. Each picture gives a unique insight into the thoughts of a German POW. Numerous Volunteers re-enactors will bring the place to life, dressed as former German PoWs, British Home Guards and American soldiers. They will be occupying several rooms/ dormitories with their full kit, equipment and brick-a-brac on display. Such equipment would have been used back in the day! Barry Ward (Preservation Group Member and re-enactor) will be talking all about the escape; how the tunnel was made and all about the prisoners preparation prior to the escape. Do not miss our Oral History Room, where you can tell us any experiences you had or any stories you know about Island Farm, Hut 9, the Welsh Great Escape and Bridgend at War. Finally a member of the Hut 9 Preservation Group will guide you around Hut 9 and talk about the Welsh Great Escape and the famous Welsh Escape Tunnel. There is no entry fee, so this is a FREE for all event!!! Due to the restricted room inside the Hut, the visitors' safety and the preservation of Hut 9, the number of visitors per tour is limited. We strongly advise people to pre-book tour time slots well in advance. Previous events were fully booked 2-3 months before their date! This shows how popular this iconic, Grade-2 listed building is. There will be a chance for visitors to take a trip back down memory lane with the attendance of "Sweet and Nostalgic". They are a local business who will be supporting our event. Booking contact details will be provided in good time before the event. If all of the tour slots inside Hut 9 become booked, we still encourage people to turn up over the weekend because there will be lots to see outside the Hut. Should spare spaces become available or people fail to turn up, then we will of course re-allocate these on a first come first served basis. Please park in the Innovation Science Park (opposite the Heronston Hotel) and walk from there down to and along the A48. There will be a sign at the start of the short path that will get you to the Hut 9 compound; a 2 minute walk. For everyone's safety, please do not attempt to stop or park your car on the busy and fast traffic A48. WE SINCERELY HOPE TO SEE YOU ON THE DAY! There will be a lot happening outside Hut 9, such as a talk by local historians and experts on Island Farm Brett Neil Exton and Richard Williams, along with a tour and talk around Hut 9 about the escape tunnel. So well worth a visit! All welcome. Please come along and support our local history. To get a taste of things to come, please visit our March 2014 Event page or a webpage about Hut 9 and a photo album relating to our September 2012 Open Doors Event. At Tesco Extra (Many Thanks Tesco!). Cowbridge Road, CF31 3SQ Bridgend. View map · Get directions. Volunteer re-enactors get a chance to display in all their finery to raise operating cost funds for the preservation of Hut 9. Currently all Hut 9 events' expenses are met either by BCBC (Big Thanks!) or donations from Friends of Hut 9. Such donations first started at our 2013 Open Doors Event. At this stage every penny counts! From the Bridgend County Borough Council web site. Members of the Hut 9 Preservation Group took part in the Bridgend Heritage Day on Saturday, which was organised by the Reach team (BCBC). From the BBC Wales web site. The Civic Trust for Wales promotes civic pride as a means to improving the quality of life for all in the places where we live and work, and encourages community action, good design, sustainable development and respect for the built environment amongst people of all ages. To find out about more places you can visit through Open Doors events, take a look at the calendar of events. Click HERE to bookmark this page in your Favourites - THANK YOU VERY MUCH EVERYONE!